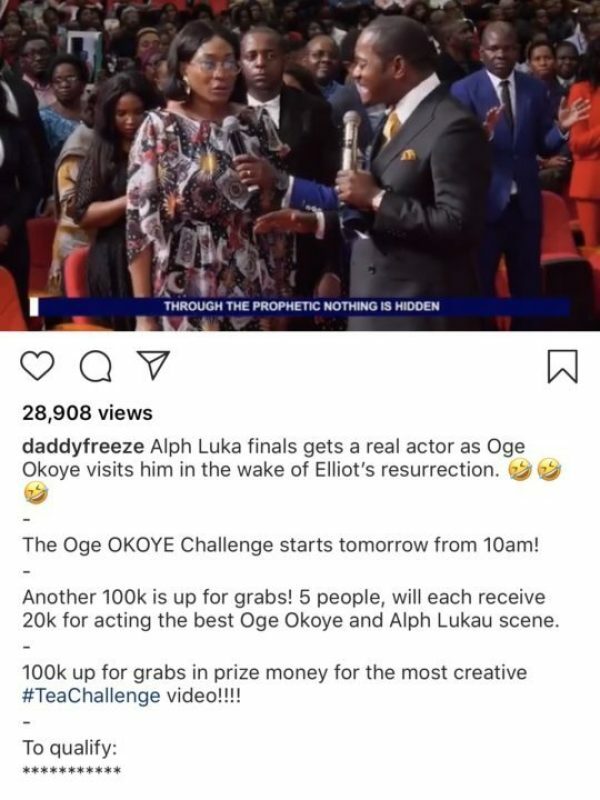 Alph Luka finals gets a real actor as Oge Okoye visited him. Alph is the same pastor responsible for Elliot’s resurrection. 🤣🤣🤣 – The Oge OKOYE Challenge starts tomorrow from 10am! – Another 100k is up for grabs! 5 people, will each receive 20k for acting the best Oge Okoye and Alph Lukau scene. – 100k up for grabs in prize money for the most creative #TeaChallenge video!!!! – To qualify: *********** – 1: follow both @daddyfrz and @daddyfreeze on Instagram. – 2: You MUST tag both my handles in your video! 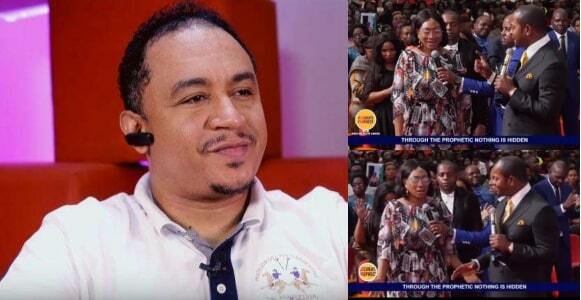 And MUST use the hashtags #DaddyFreeze #OgeChallenge – 3: shoot a 1 minute Instagram style video of this challenge. – 4: Be as creative as possible, remember the 5 (five) funniest videos win 20k each. – 5: At the end of the video, hold up a plain white piece of paper with your Instagram handle written in blue ink, this is to ensure that you didn’t just steal a video from the internet.🙄 – 6: Trying to create an original video with a twist of humor is definitely a plus. – 7: This is an INSTAGRAM ONLY challenge. – IMPORTANT POINTS TO NOTE! ********************************* If you do not obey ALL the rules, you will be disqualified!